As the nation gears up for the first phase of the parliamentary elections tomorrow, it will be interesting to see in detail the emerging candidates vying for the seat of the Prime Minister seat. Taking forward our empirical analysis of Social Media dialogues around elections, we analyze the two primary candidates, Narendra Modi (NaMo) and Rahul Gandhi (RaGa). In this blog, we have a look at their presence on Twitter, Facebook, YouTube, Instagram, and LinkedIn. 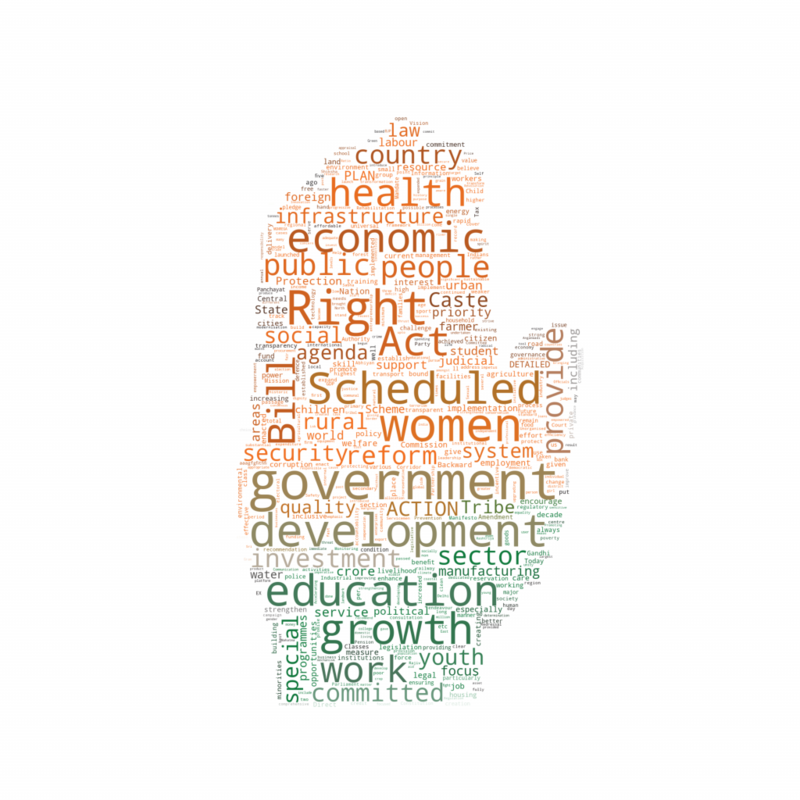 Before we get into the analysis of their profiles, we quickly visit the recently released manifestos of each of their parties and share a word cloud of the topics addressed in them. 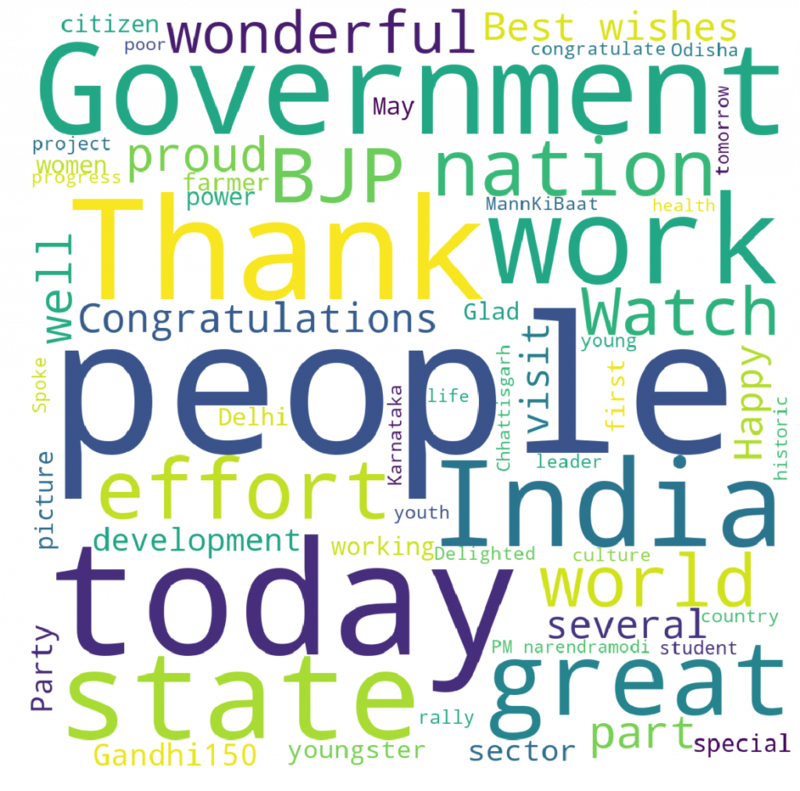 To obtain this word cloud of the manifesto, we analyzed the full text of the manifesto. 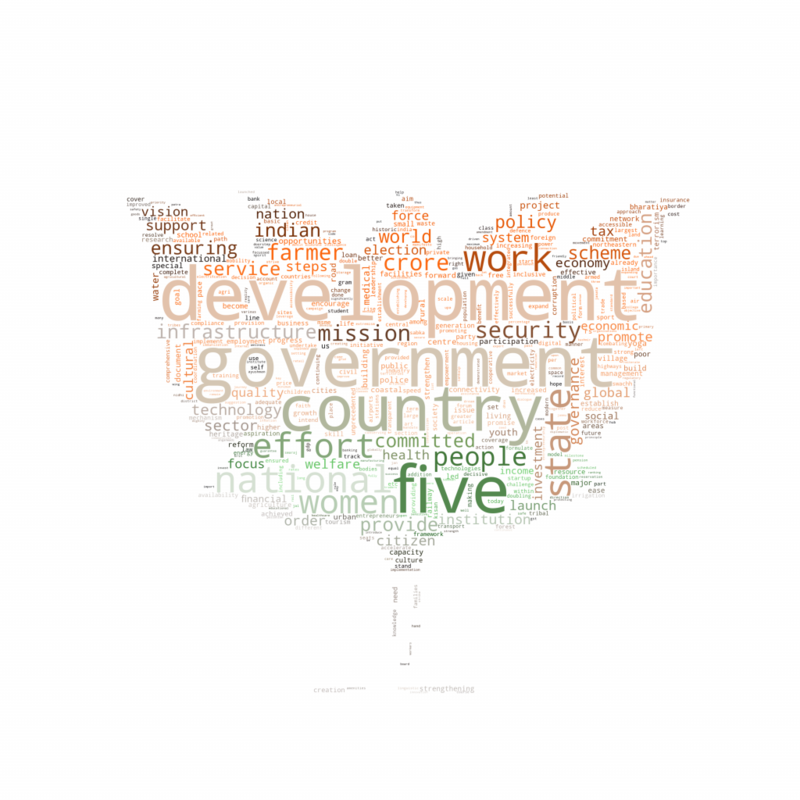 It is evident from these images that some topics are emphasized more in BJP’s manifesto and some in INC’s. Moving on to their social media personas, we first took a look at the Twitter handles, @narendramodi and @RahulGandhi. To begin with, NaMo’s account was created on January 2009, whereas RaGa’s is relatively recent and was created on April 2015. Narendra Modi boasts of a larger following with 46.8M (as of April 9, 2019) followers and follows 2,160 people, whereas Rahul Gandhi has 9.16M followers and follows 207 people. For the sake of consistency, we undertake analysis on Twitter data for both the handles starting 1st Jan 2018. 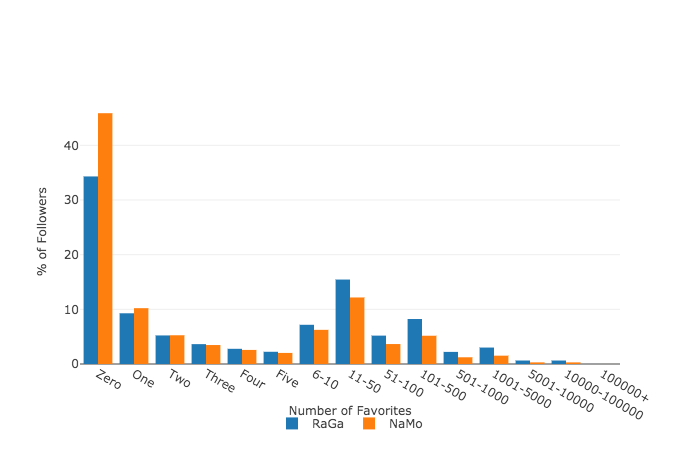 In this period, we find that NaMo has 7.5 times more Tweets than RaGa and NaMo’s Tweets are re-tweeted 3 times and favorited 3.7 times more than RaGa. The table below captures these figures for each of the candidates. Further, in order to understand how they interact with other accounts on the platform we studied the number of times each of them have replied to or re-tweeted (with a comment) a non-verified handle’s status. For a comparison, we also share the corresponding figure of the sitting President of the United States’ Twitter handle, @realDonaldTrump. 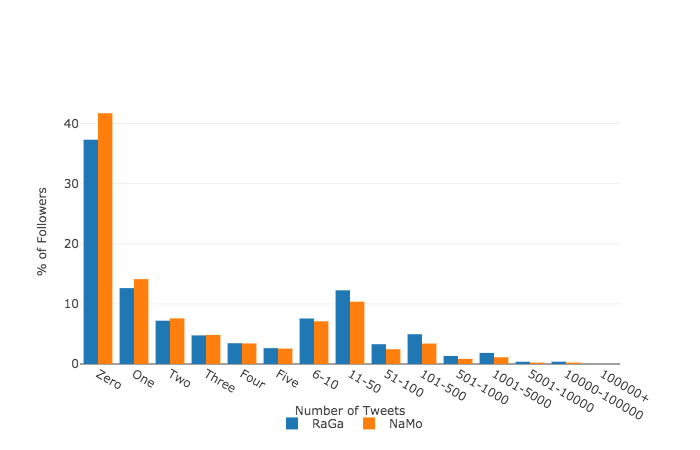 A quick takeaway from the table below is that since 2018, RaGa hasn’t replied to or quoted a non-verified handle, whereas NaMo has not replied to a non-verified handle but has quoted (re-tweeted with a comment) as much as 5.47% of his tweets in this period. Also, we see that NaMo has 10.47% of his tweets as quoted tweets, sharing tweets of both verified and non-verified handles to a similar extent. We also find this proportion to be greater than that of Trump, whose quoted tweets since 2018 form 4.02% of the share of his tweets made. The primary question that we’re interested in is whether political leaders use social media to the extent of engaging and interacting with the common citizen rather than using it just for broadcasting content. Much like the manifestos, we wanted to understand the topics that both the handles delve in through their Tweets. To this extent we modelled tag clouds of their Tweet contents. 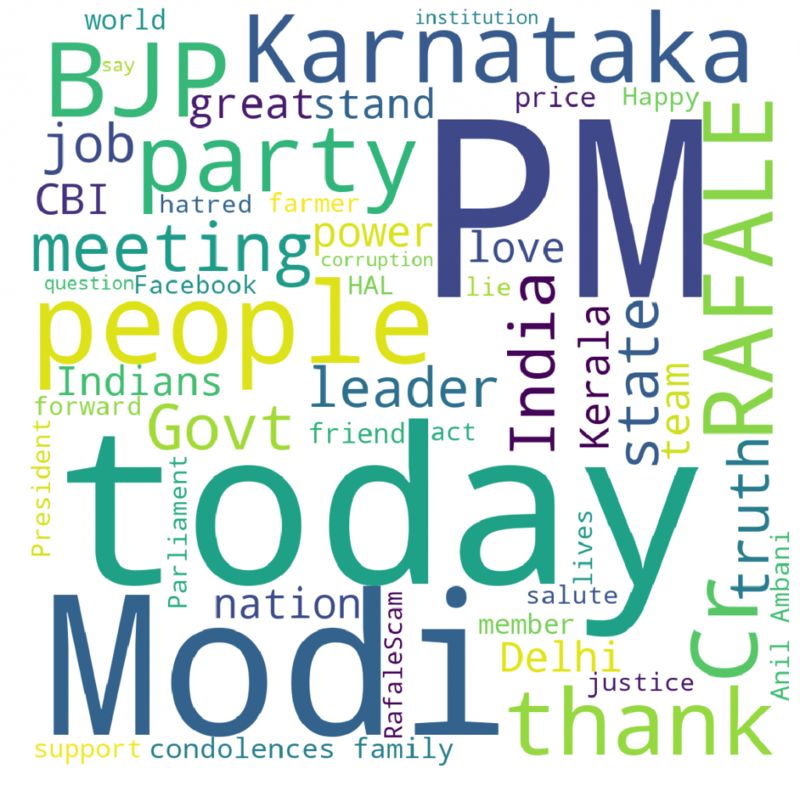 The images below are these word-clouds from the Tweets made by the handles: the left is for NaMo and the right is for RaGa. To study the users they mentioned the most and topics they addressed most frequently through hashtags, we analyzed all hashtags used and users mentioned. The table below shows the top five hashtags, and top five users mentioned by each of them; the values in the parantheses give the frequency of times that the hashtag / handle appeared in our analysis. Next, we analyzed the distribution of source devices (ex: “Twitter for Mac”) from which both these handles made their tweets from. We see RaGa posting 90.7% tweets from Twitter for iPhone and a few from Twitter Media Studio (Twitter’s Business Manager App), and the Twitter Web Client. On the other hand, NaMo’s posts seem to be coming from a host of devices, spread for the most part across Twitter’s Web Client (51.7%), Twitter Media Studio (19.4%) and Twitter for iPhone (18.04%), with some activity originating from Periscope (video streaming service owned by Twitter), Twitter for Android, and Twitter Ads Composer. Below is the graph showing these values in detail. We also analyzed the language that these handles are tweeting in. We see that NaMo has made 7.6% Tweets in Hindi and 63.2% Tweets in English, whereas RaGa has made 24% Tweets in Hindi and 72% in English. Furthermore, to understand the temporal pattern of posting or usage by both the handles over any given day, we graph the time of the day vs the number of tweets posted in that hour of the day. Below is the graph; there is no significant difference between the two handles. We find a negligible number of tweets between 2000hrs – midnight and see that the bulk of the activity is spread over the day with evenings being a priority for both the candidates. 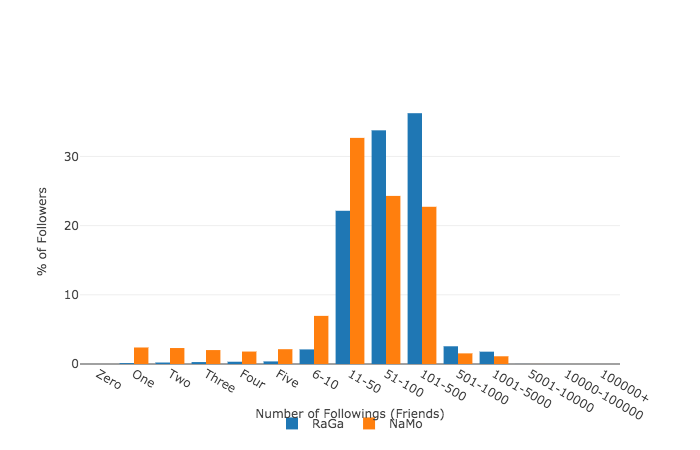 We find that the proportion of the verified handles that follow RaGa (0.027%) to be higher than the proportion of verified handles that follow NaMo (0.018%). From the table above it is interesting to note that RaGa followers have higher friends count, more followers, higher favorites count, more number of tweets posted, and more likelihood of having a profile picture. We also found 13.56% of RaGa’s followers have posted a Tweet on the platform in the last month and 18.79% have posted something this year, as opposed to 6.98% of NaMo’s followers posting in the last month and 10.11% posting this year. We found 41.71% of NaMo’s followers (translating to 19.3M handles) do not have a single tweet while this number was 37.30% (translating to 3.4M handles). The following charts present a visual comparison of the various parameters of activity of the followers of these two handles. We find that 14.3% of NaMo followers neither have a follower nor have tweeted a single tweet, this number is 12.1% for RaGa. We reported earlier that 4,587 followers of @narendramodi added chowkidar to their handle and 229,364 followers added Chowkidar to their name. To analyze if the followers of NaMo & RaGa explicitly state inclination towards either of them or their parties, we looked at username, screen name, and profile bio of all followers. To do this analysis, we look for ‘narendra’ and ‘modi’ or ‘bjp’ or ‘bhartiya janta party’ or any variation of chowkidar from previous blog or ‘rahul’ and ‘gandhi’ or ‘inc’ or ‘congress’ or any variation of berojgar from last blog in the username, screen name, and profiles. 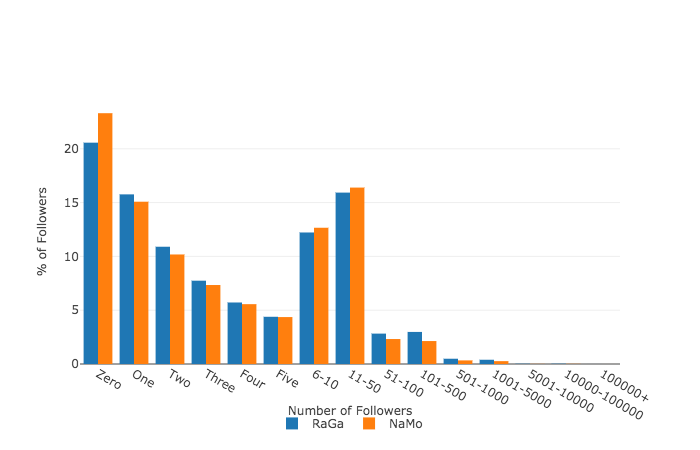 We found 1.17% of RaGa followers had NaMo while 0.5% of them had RaGa; 0.14% of NaMo followers had RaGa and 0.77% of them had NaMo. In a more general sense, in the 1,132,656 tweets that we’ve collected for the hashtag #LokSabhaElections2019, we found 28,480 mentions of @RahulGandhi and 42,577 mentions for @narendramodi. The following graph reflects the increase in their mentions in our data collection as the campaign season picked up. Moving on from Twitter, we find that the candidates have also taken to other platforms to reach out to a wider audience. We analysed the official YouTube channels for both the handles, and present the numbers we got (as of April 6, 2019) in the table below. On Instagram: RaGa has made 217 posts, and enjoys a following of 663K Subscribers and is following nine other handles whereas NaMo has made 279 posts, has 19.8M followers and doesn’t follow anyone. On LinkedIn: RaGa has 1,050 activity followers, while NaMo has 2.8M activity followers. To access our complete dashboard with interactive graphs, and data, please visit here. For any questions / analysis, please drop an email at pk[at]iiitd[dot]ac[dot]in, we will be happy to answer it for you.